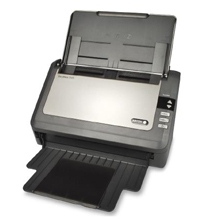 The Xerox DocuMate 3125 color sheetfed scanner quickly converts your documents, plastic cards and forms into digital files and securely saves them on your computer or in the cloud—ready to be accessed when needed. It can scan up to 44 ipm in duplex and includes a 50-page ADF. Advanced certified TWAIN and ISIS drivers allow you to communicate with hundreds of ECM software solutions. Also, it fits comfortably on any desk making it the perfect solution for any office environment. The Xerox DocuMate 3115 has all the features you expect in a powerful desktop scanner such as a 20-page automatic document feeder (ADF), 30 images per minute duplex scanning speed, and Visioneer OneTouch with Kofax VRS technology. Then at the push of a button, the DocuMate 3115 ejects from its docking station to become a full function mobile scanner. 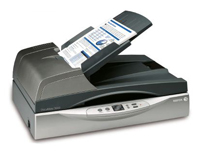 The DocuMate 3640 is a departmental duplex flatbed scanner with an 80 page Automatic Document Feeder (ADF) that scans up to 80 images per minute (ipm) in duplex mode. 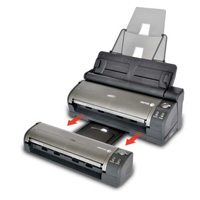 Ultrasonic Double Feed Detection ensures that no pages are missed due to a misfeed or stapled document in the ADF tray. The A4 /legal flatbed is the only departmental scanner that can be programmed to automatically scan to 99 customizable applications or devices. Documents can be converted to text-searchable PDF in one easy step. The Xerox DocuMate 4830 scanner is an effective way to index stacks of large-sized documents and import them to a content management solution in a single step. 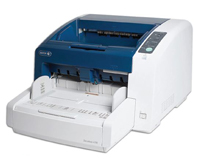 The DocuMate 4830 offers an attractive price, outstanding performance and exceptional reliability for corporate workgroups and departments and small or medium-sized businesses. A truly mobile device in every sense of the word, Xerox® Mobile Scanner gives you the power to take the information in your hand, right now, and share it with the world in seconds. The Xerox Mobile Scanner needs no cables or computer to operate. It talks to your PC, Android®, Mac®, iPhone®, iPad®, iPod® touch, or the cloud over Wi-Fi. It lets you send your document anywhere your mobile device will take you and it is as simple as the gesture of handing someone a piece of paper. 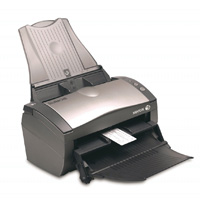 Feel confident placing the Xerox DocuMate 4799 in demanding scanning environments! 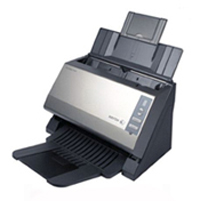 This versatile, high-speed, powerful workhorse scans up to 100 pages per minute with a daily duty cycle of 40,000. Tackle documents of various sizes with the 250 page ADF and three advanced sensor systems to ensure the scan job is not interrupted. These advanced sensor systems include ultrasonic double-feed detection, stapled-document detection, and intelligent-feed control.